The Territorial divisions in the First World War have not received as much popular attention as some of their comrades. Sandwiched between the exploits of the Regular Army at the beginning of the war, and the formation of Kitchener’s volunteer ‘New Army’, sometimes it seems like the efforts of the Territorial soldier have remained unappreciated and untold. The 58th Division is one such division, existing as such only during the war years with its origins in the pre-war 2/1st London Division. Whilst its composite battalions were not ‘pals’ battalions in the context of the new army, they had a strong London identity and were often drawn from a particular area of London or profession, such as the Post Office Rifles. Whilst the Regular Army was sent overseas to fight, the Territorials remained at home, drilling and training, and some undertaking home defence duties. 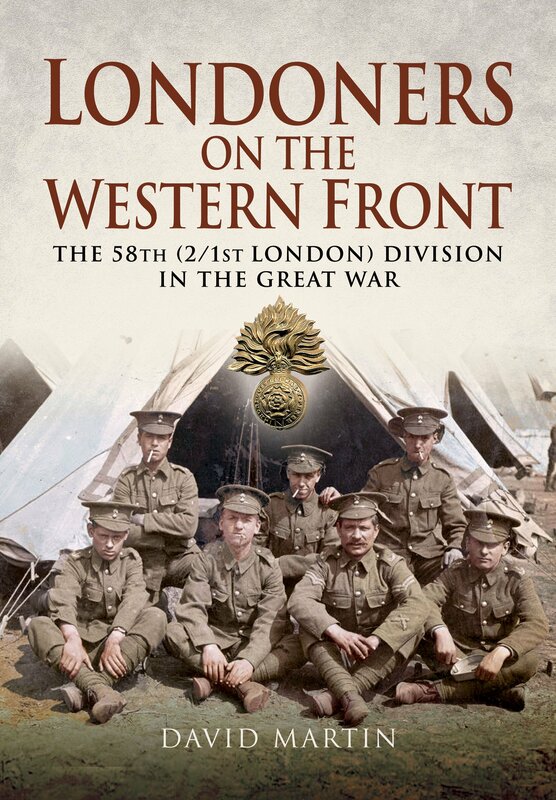 The experience of the 58th London Division was no different, and although mobilised in 1914, the defensive work and training kept most battalions of the division busy until 1916. The first battalions to be sent overseas (four battalions, or a third of the division) were sent to the Mediterranean at Christmas 1914 and were involved in the final stages of the Gallipoli campaign. In February 1917 the division was sent to the western front and shortly after witnessed the withdrawal of the German troops to the Hindenburg line. Later that year they were involved in many of the battles of the Third Ypres campaign such as St. Julien, London Ridge, and Poelcapelle. In January 1918 the division left the salient and headed to the St. Quentin sector alongside the French, where they faced the onslaught of the German March offensive. Here the division played an instrumental role in the defence of Amiens, where the Germans were held at Villers-Bretonneux. In the final push of the war over summer 1918 the division saw action at Chipilly and Epehy, as part of the breakthrough of the Hindenburg Line. When the division was demobbed June 1919, the cost of the war was more than 7000 casualties killed, wounded, or missing. The division’s legacy is a handsome memorial at Chipilly. As well as describing the movement and actions of the division, the book also provides interesting additional information such as the use of railways and the development of duckboard tracks rather than communication trenches for troop movements. Appendices list the composite units of the division, key officers, and the division’s battle honours. As with any account following more than unit it can be difficult keeping up with who is who in the narrative. Yet David Martin does a good job of ensuring all their stories are told, making full use of archive sources and some personal accounts. Some of the hand-drawn maps could have been better presented but this is a minor gripe in what is a valuable addition to the divisional histories of the war.